As recommended by the American Association of Orthodontists, we encourage an initial complimentary exam between 7-8 years of age. This gives us the opportunity to establish baseline growth and dental information to prevent, recognize or treat problems that could have detrimental effects if not addressed early. Oftentimes, addressing habits and eruptive disorders early in life can avoid or lessen future problems. An additional benefit to an early visit is the opportunity to establish communication with the patient’s dentist and the family in preparation for future visits. It is important to note that initial exams and ongoing supervisory return visits are complimentary, informational, and fun. We embrace prevention and conservative treatment and the only way to effectively do this is with ongoing supervision. Our goal is to support healthy teeth, facilitate facial growth and development, and provide lifelong confident, beautiful smiles. 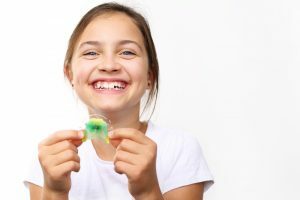 These are just a few of the questions surrounding the topic of early orthodontic treatment for children. The American Association of Orthodontists recommends that children see an orthodontist as early as age 7. At this time we will determine whether your child will need orthodontic treatment. Early treatment (also known as Phase-1 or Interceptive Treatment) sometimes begins around age 8 with the appearance of the first permanent teeth. The goal of early treatment is to correct the growth of the jaw and bite-related problems. Early treatment also helps to make room for permanent teeth, often reducing the likelihood of extractions. Orthodontic problems such as crowding, too much space between the teeth, protruding teeth, bad bites and jaw growth problems can be genetically inherited, caused by injury to the mouth, attributed to early or late loss of baby teeth, associated with habits, or due to a compromised airway. Importantly, addressing airway issues early in life can frequently help resolve problems such as nasal congestion, sleep apnea, and speech-language articulation. Most children lose all their baby teeth by age 13 and by the end of their teen years, the jaw bones will can mature and stop growing. Orthodontic procedures for adults, although effective, often take more time and can involve tooth extraction or oral surgery. Receiving early orthodontic treatment as a child can help prevent the need for orthodontics as an adult.